Today we celebrate Dr. Seuss’s birthday. He would be 107 years old today – Imagine That! Cat in the Hat! And all across the country children will be listening to Dr. Seuss favorites – from Cat in the Hat to Hop on Pop to my favorite Oh, the Places you Go! This is named Reading Across America Day in his honor and so there will be many special reading aloud events across the country today. And Dr. Seuss is definitely a Read Aloud book. Michelle Obama will be reading Dr. Seuss favorites at The Library of Congress. Libraries will have special readings and there will of course be readers adorned with a Cat in the Hat hat. Famous people have been recruited to read one of their favorites. Oh, the Places You’ll Go! Was a favorite graduation present for me to give for quite a while – I once bought five at one time for this purpose! If you see your grandchild today make sure you read a Dr. Seuss story. What makes his work so special? Yes, we all love the funny rhymes but they also take us to a place where our imagination runs wild – no matter how young or old we are. Our imagination is one of the most important things we have and one of the engines of success of our society. Although there are so many toys today that claim “to use a child’s imagination,” you can't teach that. All we can do to help a child to develop imagination is expose them to experiences that capture their imagination and let it take on a life of its own. Dr. Seuss books stimulate that experience. Read a Dr. Seuss book with your grandchild today – and smile as you can “see his or her imagination “run wild.” And please…share you memories or experience with Dr. Seuss with us by leaving a comment. 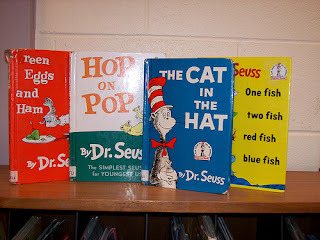 I remember reading Dr. Seuss books at bedtime to my children but I had a limit of reading a favorite twice because by that time my tongue was so tongue twisted I couldn’t read it anymore. Part of my kids' pleasure was noticing my mistakes by the second time around. Fox in Socks was the hardest one for me and so, of course, my son's favorite. I did much better with One Fish Two Fish and so that is the one I am steering my grandson to.....We'll see how long that lasts. P.S. I got to read The Cat in the Hat to my grandson, Zach when he came for lunch. We both enjoyed it. Oh My that mischievous cat!! I love reading Dr. Seuss aloud. The rhythm carries you along, and the tongue-twisters keep you on your toes. Some children's books are so prosy and lacking in rhythm that they are actually painful to read out loud. I used to groan if the kids requested one of those. I never complained about being asked to read a Dr. Seuss.